Roz Adie ceramic artist: crystalline glazes, forms, wall art, ikebana vases. Welcome, I am a ceramic artist and potter working from my small studio in Hastings, East Sussex. My work is about exploring the movement of shape in space. My pots are all individually hand made from porcelain/stoneware by throwing, slab building, press moulding and hand forming through a combination of these processes. I glaze them with my own crystalline glazes which I mix from recipes I have researched and developed. 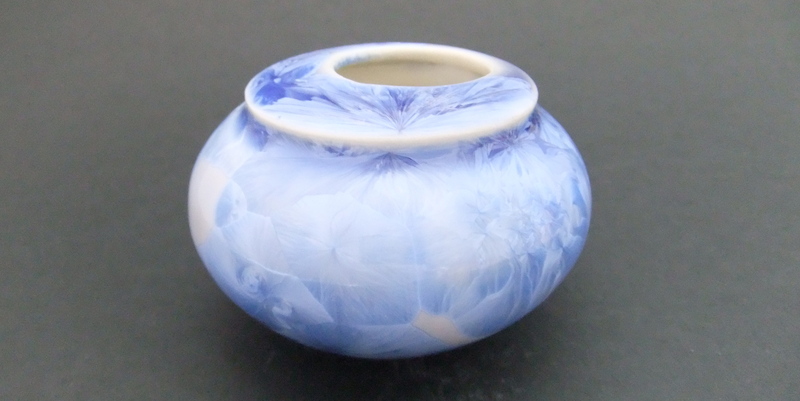 In these glazes real crystals grow in a very fluid glaze as the kiln cools from 1280 oC. The movement and growth of the crystalline glaze continues and compliments the exploration of movement in the form of the pot. My inspiration is shapes within nature. No leaf, tree or pebble is perfect in the conventional sense, nor are they perfectly symmetrical. Yet each is perfect in its sense of rightness. Each has moved through forces of growth, wind, waves to be what and where it is. The spaces between the branches, leaves or pebbles are all parts of the shapes in the spaces they occupy. I enjoy exploring movement and shape in space. I use two main method: thrown hand altered pots and slab building. I then compliment the shape with a crystalline glaze that flows over the form before being frozen in time. Returning to my early Japanese influences I am also interested in the art of flower arranging, and Ikebana*. Vases rarely seem to hold flowers easily and attractively; bought bunches which look so pretty in their cellophane wrapper rarely transfer well to the vase. So, my interest in designing vases to hold flowers easily in an attractive harmonious arrangement. Traditionally pottery has been seen as a craft rather than an art. My ceramic wall pieces are about bridging this divide; using ceramics for a canvas. Unlike many paintings or prints they can be hung in brightly lit areas without fading. I began developing greeting cards with ceramic ornaments and jewelry for family and friends. Having become somewhat disillusion on the price of greetings cards that are just thrown away, I now make cards which are decorated with a ceramic piece that can be disassembled and used once the greeting card has been displayed. I have had a life-long interest in the tactile and visual qualities of clay and pottery. As a young child I dug clay from local streams to make simple pots. I went on to study Ceramics at Bath Academy of Art, now part of Bath Spa University. My early influences included the work of Bernard Leech and the Japanese tea ceremony. I became fascinated with ash glazes and experimented extensively before I discovered crystalline glazes; this was a natural evolution from tenmoku glazes, and so I became fascinated with the elusive and mesmerising quest of the crystalline glaze. From early thrown and fluted ware I developed an interest in the translation of shapes and the sense of movement in a still form. Crystalline or crystal glazes are made from the combination of silica (glass), a flux (to melt the silica at lower temperatures) and an oversaturation of oxides to form the crystals (usually zinc or titanium). There is very little alumina (to bind the glaze to the surface of the pot and prevent running), as this prevents the crystals from growing. So the challenge of a crystalline glaze is a balancing act between a glaze runny enough to form crystals and one that will stay on the pot. Crystalline glazed pots are always fired on pedestals on trays to catch the excess glaze; these are cut away after firing. Transparent shiny glazes contain no crystals and are referred to as supercooled liquids. When a glaze is cooled very slowly crystals begin to form and the resulting glaze often appears matt. This process is known as devitrification. Crystals may give opacity, texture and colour to a glaze. Some crystalline glazes are galena glazes containing iron sulphite, adventurine glazes containing iron oxide, tenmoku glazes containing iron oxide and white opaque glazes containing zirconium silicate. The crystals in these crystalline glazes are usually very small are sometimes referred to as micro crystalline glazes. Macro crystalline glazes or crystal glazes are those which contain larger crystals floating permanently suspended in the glaze. The crystals are easily visible creating distinct light reflecting patterns. A glaze is saturated with oxides, usually, zinc, which combine to form crystals in the glaze whilst it is in a state of flux in the heated kiln. As the kiln is slowly cooled the glaze remains molten long enough for the oxides to combine to form crystals. Zinc oxide combines with free silica to form zinc silicate crystals known as willemite (Zn2SiO4 or 2Zn0.SiO2). The crystals continue to grow until the glaze becomes too viscous for the different oxides to isolate themselves and reform within the matrix of the glaze. Other oxides which encourage crystal growth are often added to the glaze, titanium dioxide being most common. Rutile (impute titanium dioxide containing small amounts of iron) may also be used, others may include ilmenite, calcia, magnsia and zirconium silicate. As well as the need for oxides given to crystallisation and the slow cooling of the kiln it is necessary to ensure that the glaze has a low viscosity (that is runny). If the viscosity is too high, for example by the presence of too much alumina the glaze will not be free flowing enough to allow the oxides to move together to form the crystals. However, the resulting difficulty is that if the glaze has too low a viscosity it can run off upright surfaces during the long cooling period. To prevent items fusing to the kiln shelf they are usually placed on supports within a catch tray. Macro crystalline glazes are usually fired to at least 1280 oC and then cooled quickly to the crystal growing range usually considered to be 1150 oC and 1020 oC, soaking (holding the temperature) within this range for periods of some hours and finally cooling naturally . Porcelain is the preferred clay body for crystalline glazes due to its purity and brilliance. Impurities within stoneware bodies often combine with the glaze so affecting the resulting glaze. Moribana: an ikebana arrangement in a low, shallow container with a wide opening. Nageire style: an ikebana arrangement in a tall vase. "nageire" means "thrown-in" in the original meaning of this term,one sticks the flowers in by simply throwing them in the vase. However, the style has become formalized. Rikka style: the first formal style of flower arrangement, developed in the early part of the fifteenth century. how the flowers are to be arranged is determined by strict formal rules. Seika or shoka style: a type of traditional ikebana arrangement characterized by a tight bundle of stems which form a triangular three-branched asymmetrical structure. this style is similar to the rikka style, but has fewer, less strict rules. it originated in the mid-18th century. Freestyle: unrestricted style, sometimes subdivided into naturalistic / abstract. Any vase or container may be used.